It’s rare to find someone who enjoys washing the dishes by hand. Using a dishwasher not only takes the dirty work out of your evening but aims to save money and time. If you don’t have the space to install a full-sized dishwasher or are looking for a more portable option, then a benchtop dishwasher is an ideal option to consider. Read on for our guide to benchtop dishwashers and brands available in Australia. What is a benchtop dishwasher? A benchtop dishwasher is designed for households that want the convenience of a full-sized dishwasher, but don’t have the option – or space – to install one. It’s considered ideal for rental properties or granny flats as it can be easily disconnected and relocated into a new home whenever you move. If you’re tight on space, benchtop dishwashers are small enough to fit in kitchens while also being big enough to wash dishes for up to six place settings. 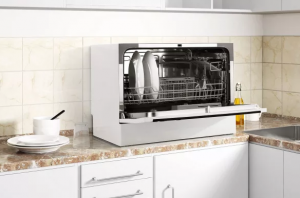 In terms of benchtop dishwasher installation, the appliance is stated to easily connect to a tap or directly to the mains for an in-built solution. How much do benchtop dishwashers cost? Due to their compact size, you can generally find benchtop dishwashers from around $500 – $700, which is about half the price of a mid-range, full-sized dishwasher. However, you do sacrifice on cleaning space as not all dinner plates are able to fit inside one of these. Most benchtop dishwashers fit plates with a diameter of 23.5cm. Nevertheless, they can be ideal for small kitchens and modest dishwashing needs, minimising on the use of space, while still providing the features of a standard dishwasher. Omega is a well-known name in many Aussie households, offering a “complete kitchen solution”. 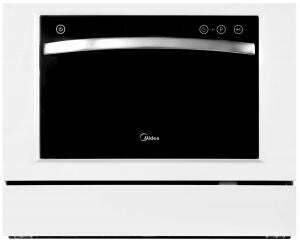 It offers an extensive range of ovens as well as washing machines and a couple of options for benchtop dishwashers. 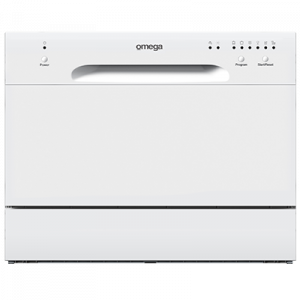 The Omega ODW101W 60cm compact benchtop dishwasher features six place settings and a white finish. With its dimensions of 438 x 550 x 500mm (HxWxD), it fits a plate size of up to 25cm. It’s equipped with six wash programs – intensive, normal, rinse, rapid, heavy and soak – but doesn’t feature a delayed start or adjustable top basket like some other brands. It allows for variable wash temperature settings with electronic controls and has a noise level of 51dB. With a retail price tag of $599, it has a 3.5 stars water efficiency rating and a two star energy efficiency rating. For the same price, a similar model available is the Omega DW101WA 60cm compact dishwasher. It has the same features and capabilities but with a different control panel style. Furthermore, it rates 2.5 stars for water efficiency and two stars for energy efficiency. Both of these models have three variations, including built-in, freestanding or benchtop with a 24 months part and labour warranty. 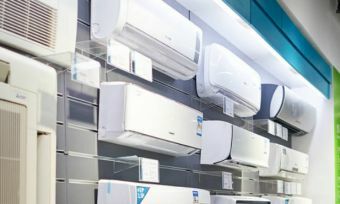 Midea covers a number of laundry and home appliances from air conditioners to fridges and ovens. Its benchtop dishwashers are boasted to be ideal for studio apartments, caravans or regular sized kitchens. The Midea WQP6-3604-AU Benchtop Dishwasher has a compact size of 438 x 550 x 500mm (HxWxD), with a 2.5 star energy efficiency rating. It’s designed with a white wash finish and six place settings. It also offers six different wash programs and has a noise level of 49dB when working. The retail price tag is $532. If you live in a household of just one or two people, you’ll be able to tackle small loads with this appliance. The Ilve brand is dedicated to bringing a taste of Italian hand craftsmanship into the Aussie home, with its ovens particularly impressive. The Ilve IVDFS55 Benchtop Dishwasher has a sleek stainless steel finish to blend in nicely with any other stainless steel appliances you may have in your kitchen. It requires a connection to cold water only and has similar dimensions to the models above of 438 x 550 x 500mm (HxWxD). It features six wash programs, including an ‘Eco’ mode and a heavy cycle. When working, it’s stated to have a noise level of 49dB. To make use of off-peak hours, the 9VDFS55 benchtop washer features a delayed start option, which can be set up to 24 hours in advance. It has a 3.5 star water efficiency rating and a 2.5 star energy rating. The retail price tag for this model is $699, being a possible option for a small household if you’re looking for a compact model to fit in the kitchen. 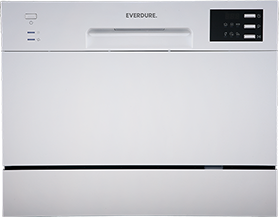 Covering all aspects of heating and kitchen appliances – as well as the outdoor essentials, such as BBQs – Everdure also offers one benchtop dishwasher. 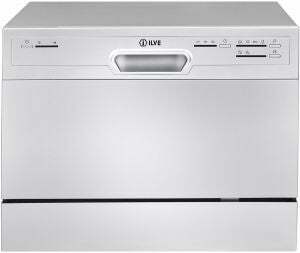 Everdure’s 55cm freestanding dishwasher (DWC066PS) is equipped with six place settings and six wash programs. It features a delayed start function of up to 24 hours, which allows you to set the start time to a more suitable time for you, while also providing the opportunity to take advantage of off-peak power times. The 55cm model is also equipped with a start/pause function, electronic controls and an LED display. There are two colour variations – silver or white finish. Its dimensions are 438 x 550 x500mm (HxWxD). The noise level of the appliance when working is 49dB, which is fairly similar to other brands. It has a 3.5 stars WELS water rating and 2.5 stars energy efficiency rating. You can find the Everdure model around the $400 mark at Bunnings, with a three year warranty available. 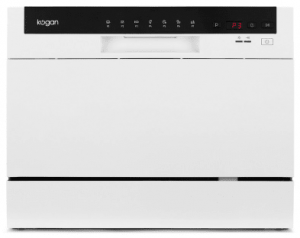 Being one of the largest online department stores in Australia, of course Kogan also offers a benchtop dishwasher. Kogan’s Benchtop Dishwasher can be found for $449, with a portable footprint of 430 x 550 x 500mm (HxWxD). It features seven washing programs – intensive, heavy, normal, glass, rapid, 90-min and self-cleaning – allowing you to choose the right one for your dishes so that they get the ideal clean. It boasts a maximum plate diameter of 25.4cm, which is larger than some other brands and has six place settings with a foldable cup holder and removable cutlery tray. In terms of energy efficiency, it has a 2.5 star energy efficiency rating. Should I buy a benchtop dishwasher? For single and couple households that don’t want to wash dishes by hand, this might be an option to consider. The countertop dishwasher is typically compact and portable, being suitable for apartment living where space is at a premium. However, most benchtop dishwashers are not very energy efficient, with three stars typically the best you will find. That’s something to keep in mind if you’re concerned about power costs. Furthermore, not all can fit large dinner plates, so you’ll have to compromise on size. Nevertheless these appliances still offer a number of place settings and are generally all priced under $700. If you’re renting a home, or don’t have much under bench space available for a standard dishwasher, then a benchtop dishwasher might be for you.